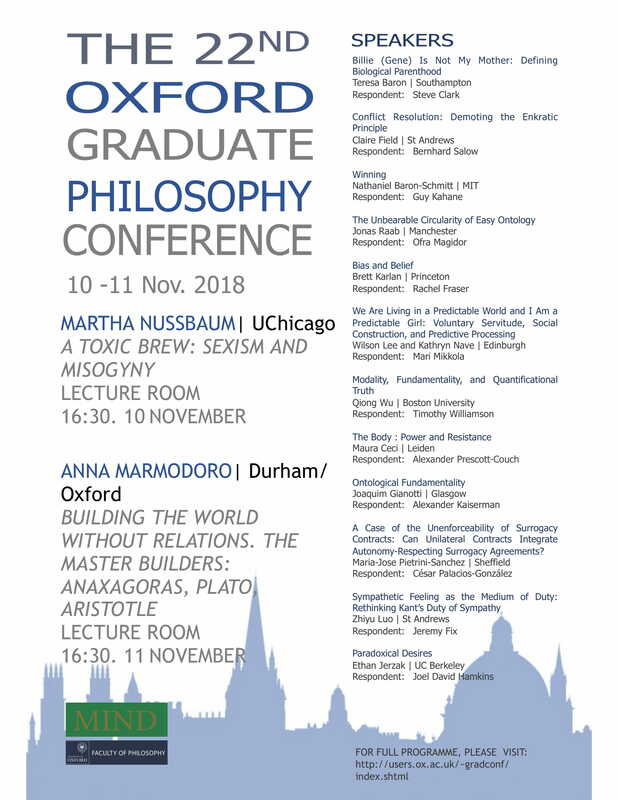 The Oxford Graduate Philosophy Conference will be held at the Faculty of Philosophy November 10-11, 2018, with graduate students from all over the world speaking on their papers, with responses and commentary by Oxford faculty. I shall be the faculty respondent to the delightful paper, “Paradoxical Desires,” by Ethan Jerzak of the University of California at Berkeley, offered under the following abstract. I present a paradoxical combination of desires. I show why it’s paradoxical, and consider ways of responding to it. The paradox saddles us with an unappealing disjunction: either we reject the possibility of the case by placing surprising restrictions on what we can desire, or we revise some bit of classical logic. I argue that denying the possibility of the case is unmotivated on any reasonable way of thinking about propositional attitudes. So the best response is a non-classical one, according to which certain desires are neither determinately satisfied nor determinately not satisfied. Thus, theorizing about paradoxical propositional attitudes helps constrain the space of possibilities for adequate solutions to semantic paradoxes more generally. The conference starts with coffee at 9:00 am. This session runs 11 am to 1:30 pm on Saturday 10 November in the Lecture Room. 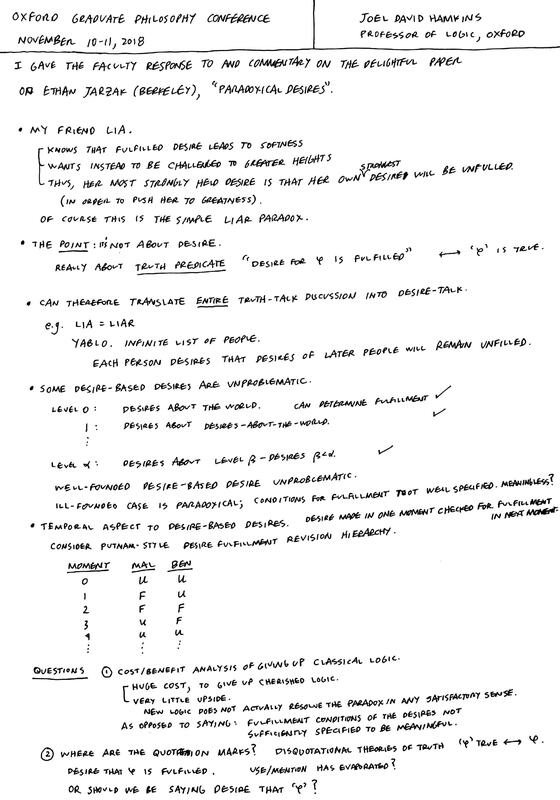 Here are the notes I used for my response. This entry was posted in Talks and tagged desire, Graduate Philosophy Conference, liar paradox, Oxford, truth by Joel David Hamkins. Bookmark the permalink.